Yours Truly: CCNS103: Merry Christmas, Deer! I'm getting a head start on Christmas cards this year. It's only 3 months away! 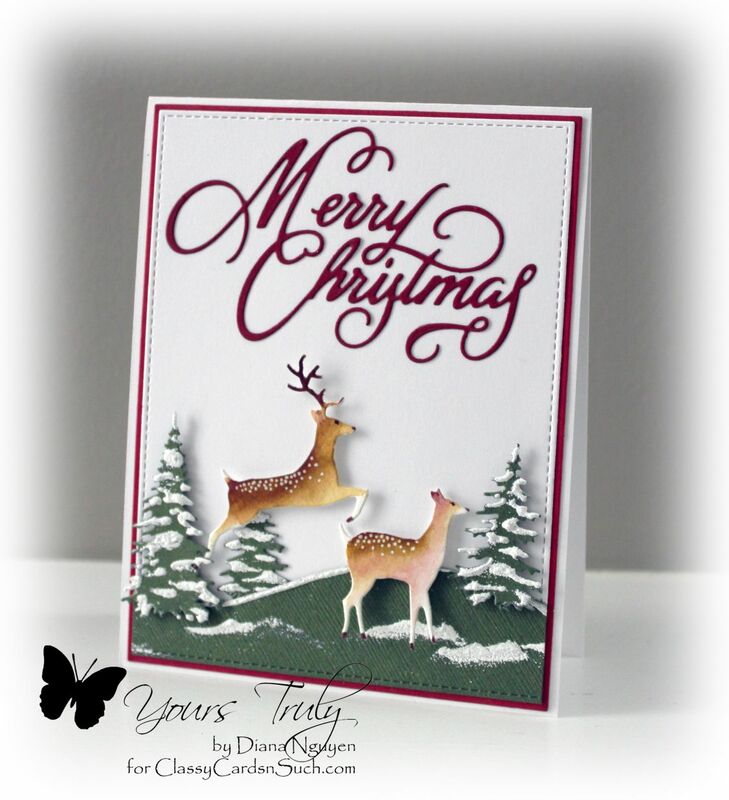 For this Christmas card and this week's challenge with the deer inspiration, I went with the colors as well as making a scene with deer. To start, I matted my die-cut using the large stitched die from MFT Blueprint 13 using the large die from Spellbinders A2 Matting Basics A and red card stock. The scene used Impression Obsession Evergreen Trees, Poppystamps Forest Deer, and Impression Obsession Merry Christmas, and lots of small Joy! foam pads. I used the Art Institute glue to adhere the thin lettering. The deers were cut from watercolor paper and colored with watercolor brush pens. After it dried, I went back and added the white markings with a white gel pen. To make the snow on the trees, I used the ice white Viva Decor Pearl Pen and white detail embossing powder. While the pearl pen was still wet, I add the powder and then used heat gun to set it. The pearls bubbled up a bit - and I loved that the powder was not nice and clean - I couldn't make the scattered snow if I tried. Thanks for looking and I hope you get a chance to play along this week! 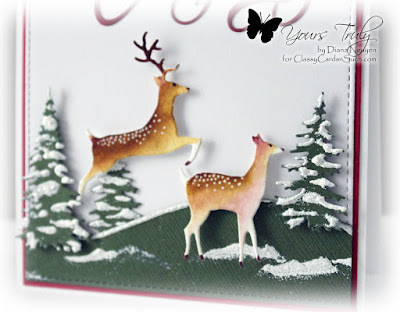 The dimension on this card is super and the deer look so realistic. Thank you so much for taking time to post your very creative art with us this week at Word Art Wednesday in our 201st AG challenge! Wowzers! This is super pretty and elegant! I love every single detail and the layering is perfect! Thank you for playing along in the Word Art Wednesday Challenge! Have a blessed day!